Since Davido lost to Tiwa Savage at the MTV Europe Music Awards, (MTV EMAs), which recently held at Bilbao Exhibition Center, Bilbao, Spain, where the acclaimed African queen of pop music beat the ‘Assurance’ crooner alongside Fally Ipupa, Distruction Boyz, Shekinah, Nyashinski, to win the Best African Act award category, mixed reactions have continued trailing his big loss. 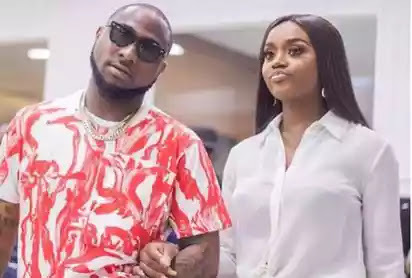 Davido and Chioma Reacting to Davido’s loss, a fan simply identified as @mevlon_beauty, blamed Davido’s girlfriend, Chioma Rowland, for being the brain behind his misfortune at the MTV EMA. “Since Davido started rolling with Chioma, he stopped progressing”, the fan wrote on Instagram. However, others refused to share the same sentiment with her as they disagreed with her opinion on the matter. While some believe Chioma cannot be responsible for Davido’s loss, others believe it was just a streak of fate. @patienceleo123 believed the statement was out of pure envy for Chioma. “Because some people are angry with this Chioma that is why many people didn’t vote for Davido”, she wrote.